Parking is FREE at Naples Zoo. Naples Zoo has restrooms accessible for those with disabilities in the main gift shop and also has accessible restrooms and a family bathroom on Shoreline Trail in the zoo. There are concrete sidewalks to Safari Canyon and the Café and paved walkways throughout the Zoo. Wheelchairs may be taken into the Safari Canyon theater where there are wheelchair-reserved spaces in the front row. For the safety of our guests in wheelchairs during boarding of the Primate Expedition Cruise, wheelchairs may not be accommodated on the catamarans due to varying levels of the lake. Similar to many rides at attractions, guests in wheelchairs must leave the chair on the dock and transfer into one of the seats on the boat. The main path through the garden is almost a mile in length and is paved. There are some alternate paths and viewing areas that have natural paths. 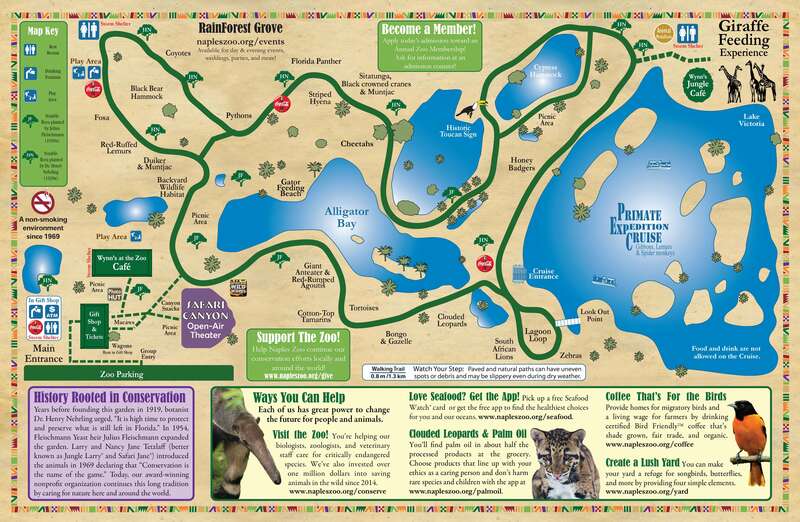 Click here for a zoo map. Click here for information on wagon and wheelchair rentals. In compliance with the Americans with Disabilities Act's requirements on service animals, fully trained service dogs are welcome. It is our intent for all guests to safely enjoy the zoo's experiences while being responsible stewards of the rare animals in our care including rules set by the USDA Animal Welfare Act. Because of this, we have some considerations where the presence of a service dog poses a safety threat to our staff or the animals. We recognize that these guide dogs are highly trained and reliable. These considerations are based on the exotic animals' reactions, not the guide dog's actions or responses. Please download and review our Service Dog Policy which details the sensitive areas. To expedite your entry, feel free to fill this in and email it in ahead of time with the date of your visit or bring it with you. This is also available at the gate. As a lover of animals and a zoo supporter, your understanding is greatly appreciated as Naples Zoo carefully makes decisions for both your safety and enjoyment along with the welfare of our wonderful animals. Click here for full page PDF of this general information. Additionally for guests with little ones, Baby Changing Stations are located in both men's and women's restrooms. There is also a family restroom located on Shoreline Trail in addition to the men's and women's restrooms. Naples Zoo has professional photographers throughout the Zoo during your visit to capture special moments for your family. You can purchase images right at the gift shop or if you miss them, you can purchase them through our online portal by clicking here!